A water fountain for you cat can offer you and your cat (or cats) several benefits. Not only will the water have a continuous flow, your cat will be more likely to drink more water since it will be constantly fresh. Yet finding the best water fountains for cats can be a small challenge since there are several designs and brands available. Have a look at the top 5 best water fountains for cats to help narrow down your search and find your cat the most suitable water fountain for their needs. It may come to some surprise, but cats are actually quite picky when it comes to their water source. Some cats prefer the classic stainless steel, while others are fine to drink from plastic. Other cats, will be drink from the dripping tap. Water fountains for cats are made from many types of materials and designs that can suit your cats wants and needs. Keep in mind though, that cats as a species do not like to have their whiskers touched when they drink, so be sure to provide your cat with a wide bowl so they can avoid their sensitive whiskers being touched. You should also consider how much water the water fountain will hold. This is more important should you have multiple cats or will be out of town for a few days. To give you a quick run-down on what cats water fountains basically are, there are three main types. These a few different types of water fountains include: charcoal filter systems, gravity, and multi-stage filtration systems, what is known as ‘bubblers’, and fountains. Bubblers will include and air pump that will continually oxygenate the water. The gravity fountain will operate in the same style as say, an office water cooler. The water tank will be turned upside down and will continually fill the bowl as the water is drank. While the gravity water fountains are great for holding large amounts of water, they will make a little noise while they are in use. As the water moves through the system, there will be a ‘blurb’ sound made by the system. Some pet owners choose to use this type because they believe that they will be quieter since there is not a motor included. There is one thing you should be aware of though- gravity water fountains tend to be quite messy as there is nearly no way to refill it without spilling some or even a lot of the water. This is because there is no valve that will close off the water storage. It will take some serious practice as well as some finely tuned motor skills to be able to quickly get the tank back into position before there is a lot of water on your floor. The water fountains that include charcoal filters can be difficult to clean. It will take several rises to get the tiny black pieces of charcoal out of the water reservoir. Not to mention, you will need to change the filter often which will end up costing money over time. You will also need to keep a careful on the actual water because these types of water fountains will begin to make loud whirring and moaning sounds when it is too low or empty. If you decide to choose a bubbler, be aware because they can actually scare your cats. This is especially true if you have a timid cat. Bubbler water fountains will not filter the water. They simply keep it moving so the water remains fresh and oxygenated. While there is not a filter included, the bubbler type water fountains are easily cleaned than those that have a filtration system. Whenever you do decide upon a water fountain for your cat, there are a few things you will need to keep in mind for the overall care and maintenance of the water fountain. Make sure to change it monthly- at a bare minimum. Some brands will suggest changing the water ever two weeks, but in general monthly is enough- especially if you have multiple cats using the system. When you do change the water, make sure to give your water fountain a good wipe down and rinse. This will prevent mold and mildew from forming and help get rid of any bacteria or build-up of grime that water bowls are known to produce. If you end up choosing a filtration water system for your cat, you are also choosing the filter that goes along with it. Keep in mind that brands will have a filter that is specific to that water fountain and only that water fountain. That being said, be prepared to invest on the on-going costs that are associated with using a filtration system. 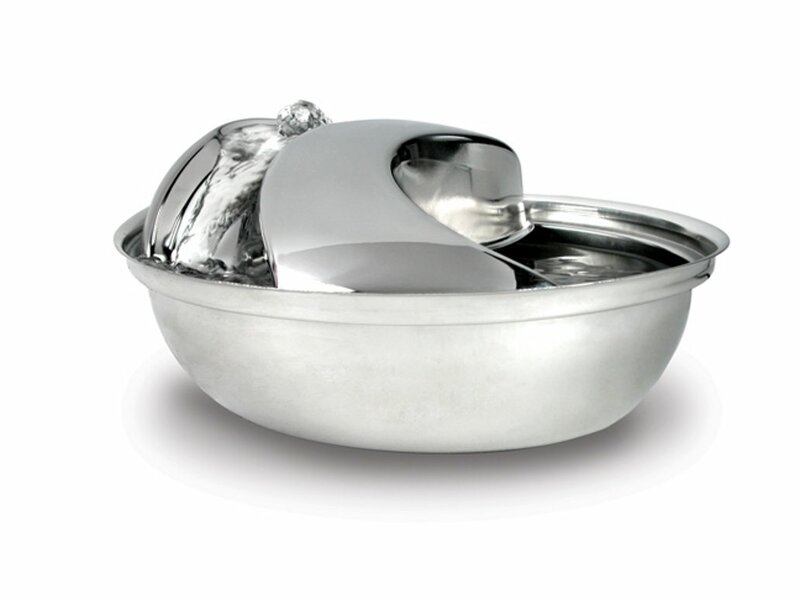 The Pioneer Pet Raindrop Stainless Steel Pet Drinking Fountain is made from a high quality and pet safe stainless steel. This water fountain will continuously circulate the water and will filter it with a charcoal filter so your pet will always enjoy fresh and clean water. 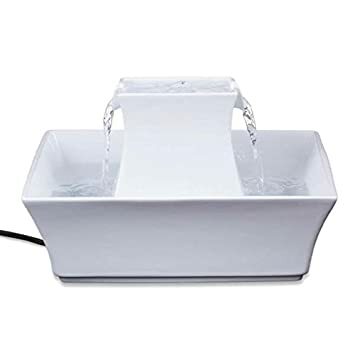 This water fountain is dishwasher safe for easy cleaning when it comes time to change the water and it can hold up to 60 ounces of fresh water. The PetSafe Drinkwell Mulit-Tier Pet Fountain is a great choice if you have multiple pets since it can hold up to 100 ounces of fresh water. With a free falling stream your pets will be encouraged to drink more water. This feature is great for cats that already like to drink from a dripping tap. There is a carbon filter that will filter the water and help keep it fresh. And since this water fountain has multiple levels, the added elevation can be an added bonus for senior or arthritic pets. The Catit Fresh & Clear Stainless Steel Top Drinking Fountain will provide your cat a continuous flow of fresh water in a stainless steel bowl. The re-circulation system will cool down and aerate the water which will inhibit the growth of bacteria and keep the water clean and fresh. This water fountain for cats is recommended as one of the most hygienic by vets and it will work along with a filtration system to ensure the water is always clean and free from debris. The water fountain can hold up to 64 ounces of water for your cat to drink from. 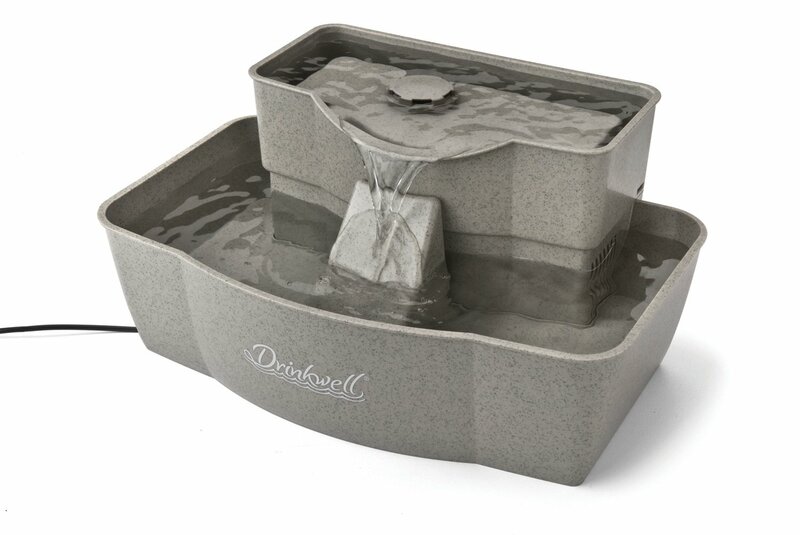 The PetSafe Drinkwell Ceramic Pagoda Fountain for pets is a high quality water fountain made from lead free ceramic. 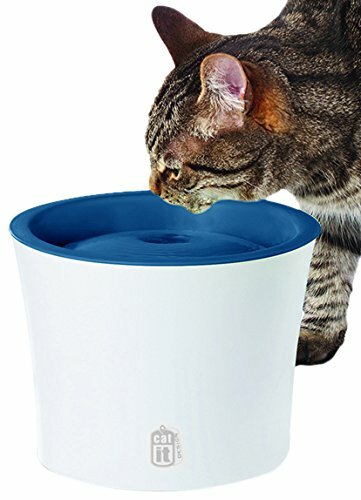 With a water capacity of 70 ounces, it is a great choice for multiple cats. Not to mention the porcelain design is modern and sleek which is great for homes but more importantly, more hygienic for your cats. There is an included carbon filter that is easy to replace and will help to keep the water fresh, clean, and free from bad tastes and odors. Since the PetSafe Drinkwell Ceramic Pagoda is multi-tiered, there are actually two drinking areas for your pets. The Catit Design Sense Fountain includes a water softening cartridge to give your cat the freshest and cleanest tasting water while it filters out any minerals, sediments, debris, hair, or food. Since this water fountain can hold up to 100 ounces of water, it is a great choice for a multiple cat household. This system will re-circulate the water which will aerate and cool down the water inside. There is a wide basin which will improve the oxygenation as well as give your cat plenty of room to drink from without touching their sensitive whiskers. Finding the best water fountain for cats will depend on the specific needs for your cat or cats. Make sure to cater to their needs and their drinking habits and encourage more water drinking with the help of a clean and fresh water source provided by a water fountain. While we have given you the list of the top five best water fountains for cats, we have a favorite among the five. 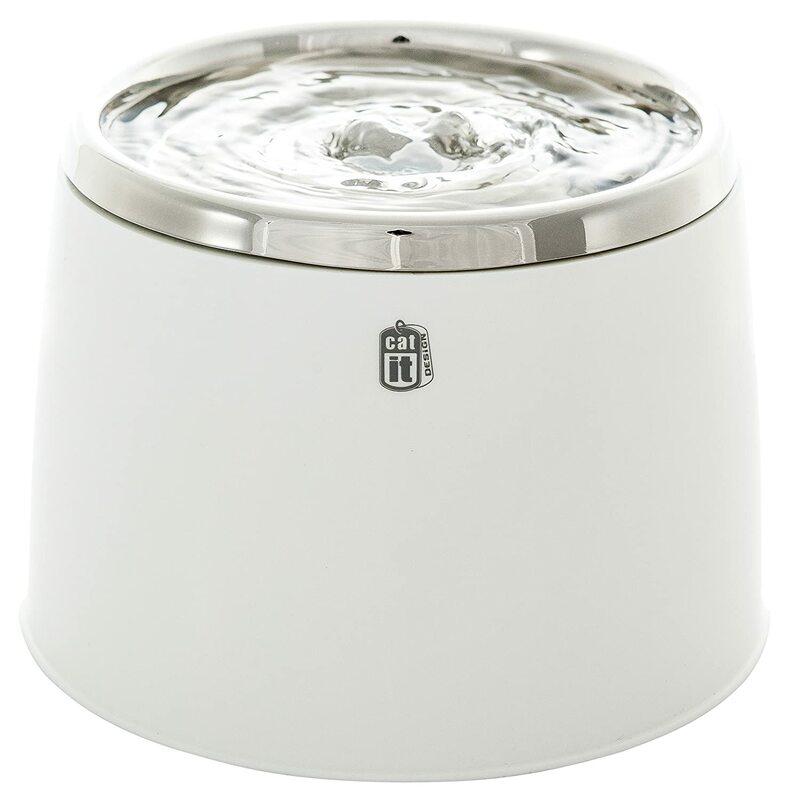 Our favorite water fountain would have to be the PetSafe Drinkwell Ceramic Pagoda Fountain for Pets . Not only is it a great option for a multiple cat household, the sleek and modern design of the ceramic water fountain is great to look at and it is safe for your pets. In addition, this water fountain will ensure your cat is receiving fresh and cool water all day long. Many cats love to drink from the dripping tap and they can still satisfy this desire with this water fountain. Whichever water fountain you decide to use, you can be sure any of the 5 best water fountains for cats can help you make the right choice. Her experience as a veterinarian stretching back more than fifteen years, Francis D. Ross has spent ten years of clinical practice as an equine veterinarian and companion animal practitioner. She has also done work as a regulatory veterinarian for the government, giving her a unique and useful perspective of the policies that affect animals’ and animal owners’ day-to-day lives. An avid writer, she specializes in formal educational pieces and casual blog posts alike, and she has done guest spots on many animal-related podcasts.